Are you looking for a company in Gladstone, MO that offers tile installation, hardwood flooring installation, home remodeling and carpet installation? If you are, then you should consider contacting Kenny’s Tile. It takes a lot of experience in order to install hardwood or any other type of flooring. Our company has been serving Gladstone and surrounding areas ever since 1954. Not only do we offer tile installation, hardwood floor installation and carpet installation, but we can also install granite countertops, whirlpool bathtubs and staircases and even refinish hardwood floors. Our company has set the standards for others in the remodeling and construction industry to follow. All of our remodeling and design experts are employed by Kenny’s Tile. We will be able to manage your Gladstone home remodeling project in a professional manner from beginning to end. No portion of any project will be subcontracted. At Kenny’s Tile, we want to help you make your Gardner home as perfect as possible. With our new interactive design center, you will be able to use your smart phone or iPad to get access to the latest design apps. You will also be able to work directly with our design staff members. They will be able to assist you with your home remodeling needs. And best of all, you can take advantage of our design service free of charge. Call and make an appointment or just walk in. 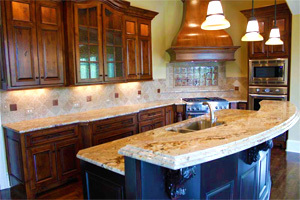 We also try our best to make our granite counter top and hardwood flooring installation services affordable. We know that many of our customers are working on a tight budget. We know that many other companies will charge you a lot of money just to do the same amount of work. We take a lot of pride in our work. Contact us today, so we can explain more about how we can help with your Gladstone home remodeling project. We are ready, willing and able to take care of your granite, tile and hardwood floor needs. We not only strive to make sure that the service we offer you is phenomenal, but we also try to ensure that projects are completed within a timely manner. Call Kenny’s Tile today for great service at a great price.